For a dozen years, MHI has welcomed hundreds of college and university students to both ProMat and MODEX for Classroom Day. The program is sponsored and underwritten by MHI’s College Industry Council on Material Handling Education (CICMHE) and Career & Technical Education (CTE) Program in partnership with the Material Handling Education Foundation Inc. (MHEFI) and the Material Handling Equipment Distributors Association (MHEDA). Five years ago, Classroom Day sponsors also began inviting high school, technical school and community college students to participate. These students represent MHI’s Career & Technical Education (CTE) Program. It was a natural evolution of the event—particularly with CTE’s development of four Fundamentals of Warehousing and Distribution textbooks, which have been largely adopted by those institutions. 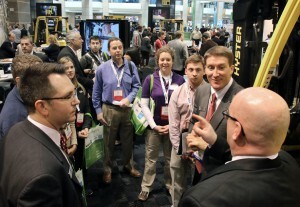 Inviting those students and instructors to attend ProMat and MODEX was a logical step. During the Classroom Day event, participants are introduced to the many ways material handling and logistics solutions make supply chains work. They learn about new and developing technologies, get insights into industry trends and discover more about potential careers. Select exhibitors visit with the students during guided group tours of the show floor, explaining their technologies and answering questions.